This is a very relevant post for the aging population today. It’s nice to see this not just for moms but grandmothers too. The walker is a great idea! Kathryn – I was thinking the same thing about grandmothers. Glad you found it helpful! I really like the digital frame suggestion! That’s a brilliant idea. Thanks for sharing! So glad you found it helpful. I think those digital frames are the best invention! I went with the obligatory nightie for my mother-in-law, and for my mum it will be something I make out of stained glass – although she does love a good chocolate or two! Can’t go wrong with a nightie! And you stained glass gift sounds lovely. You are blessed to have both “mothers” still with you! Great one, Cathy! My mother used to live in a retirement home and I remember some of the gifts she liked, one of them being a book of stamps…LOL! Wonderful idea for a post. My mother has advanced Parkinson’s Disease and these are great ideas. I LOVE the big print playing cards. I buy her large print books, but I never thought of playing cards! That’s a fantastic idea and something we could do together. Thank you for that! Julie – so glad you found this post helpful. I loved those large print playing cards. It’s so important to do things together. Enjoy your Mom! What a brilliant idea for a post. It’s always hard to decide what to get someone for Mother’s Day. Great ideas. Thanks, Rebecca. It was fun thinking about it and “shopping” for it! So glad you liked this post and the choices! I thought those cards were so great when I saw them! These are such great ideas! This will be my first Mother’s Day without my Mom. Firsts are always so difficult. She would have loved the digital picture frame. Ellen – this is my 2nd year without my mom. The first one was rough. My heart goes out to you. I think those digital frames are the best invention. Hugs! So glad this was helpful! Thanks for reading and commenting. Let me know how she likes it! I am very blessed to be celebrating this Mother’s Day with my amazing mom. I love your ideas for gifts! Yes, having your mother still with you is a blessing! Enjoy your time together! These are really some creative, wonderful ideas. As someone with an elderly mother I thank you for the help! So glad you found this post helpful! Thanks for reading and commenting! I love that door wreath and the photo frame too! All terrific gifts for sure! When my dad was in assisted living, all the people had a wreath or door decoration of some kind. That’s how my daughter started her wreath business – making Houston Texans wreath for him. As the memory slipped, it helps people identify their own “place” plus is a good expression of their personality. Never would have thought of that until our family experienced it! These are great ideas! Those big playing cards would especially be appreciated! I couldn’t resist those – and I may be needing the bigger print myself before too long! Hi Cathy some lovely gift ideas here and I love the wreath. We just don’t do wreaths in Australia and I’m not sure why. I’d love the chocolates and the hand cream thank you. Unfortunately, I don’t have my mum anymore but enjoy remembering here by spending the morning running the Mothers Day Classic with my daughter who is now a mum herself. What a wonderful way to honor and remember your mom together. And getting to do it with YOUR daughter is the best! My fav of these are the large print playing cards. Those make a great gift I’m sure. I thought so too! When my dad lived in assisted living I saw groups of ladies who played cards every day. A popular pastime there! And now that I’m getting a little older, I wouldn’t mind some bigger print cards myself! 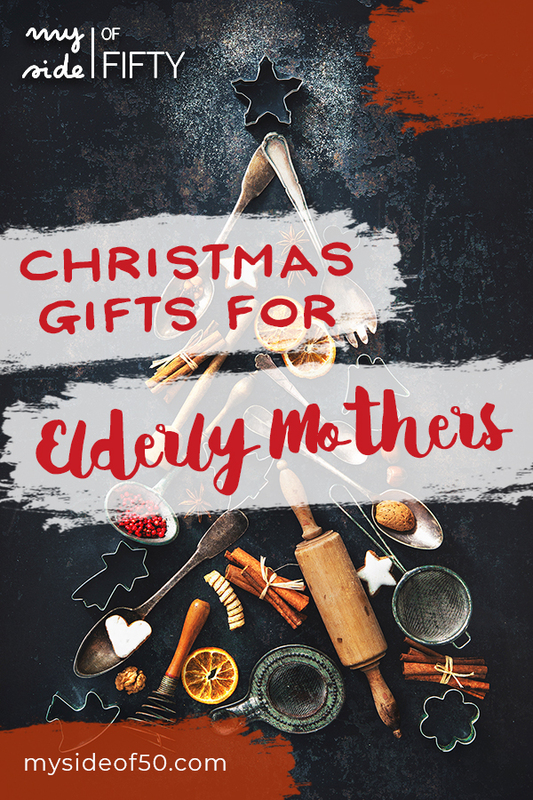 This is a great list of gifts for the mother who has everything. Thanks for sharing it with us at the Over the Moon Link Party. Thanks, Sandy. I am so pleased that readers found it helpful! That warms my heart to think about how much joy she received from that digital frame! Sue – I know what you mean. So many of my friends who still have parents or in-laws still living have this same issue. Who doesn’t like chocolates? 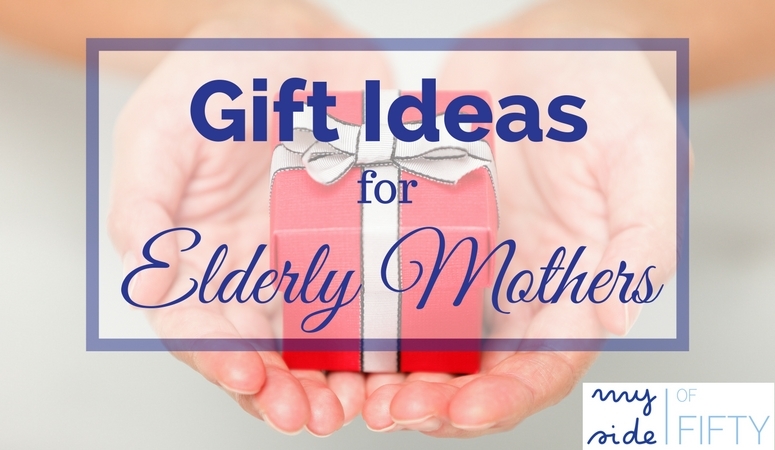 What great ideas for the mom who probably has everything and still likes to receive gifts. Thanks for the list. The digital frame is an excellent idea! Also, the unscented lotions. I have an allergic problem, myself. Yes – I really like that frame too! Glad you found some useful items for your mom on the list, Michelle! I love the wreath! My mom worked in assisted living for years and I would love to walk around and say hello to those living there and check out their wreaths, it’s a great way to find your room and bring a smile to your face. Amy does a great job, these are gorgeous. Thanks, Nikki! Dad loved the Houston Texans wreath that she made for him. Thanks so much for the list! My husband’s mom is in assisted care so it’s always a trial to figure out what we can get her she can actually use! Inevitably we fall back on socks and comfy sweats. Love the idea of a wreath! Stacy – may dad was in Assisted Living at the end of his life, so I know first hand how hard this group is hard to shop for. Glad you found some good suggestions for your Mother-in-law! Chocolate is always a winner! Thanks for reading and commenting, Janice! Nice and appropriate, Cathy!! Although I did give my mom my old Kindle and she complains that she likes holding a book instead! 🙂 I think if she used it more she’d realize how great it is because she can change the font size so easily!! But you know those stubborn Germans—LOL!! Jodie – being able to change the font size is the main reason I think the Kindle is so great. My mom was very tech savvy and once the got an iPad, she never went back to regular books. I read on mine all the time, but admit, every once in a while it is nice to hold a real book in your hands! The walk tote is just the gift for my mother in law. Thanks for the idea. Kellie – I’m so glad that my post gave you a gift idea for her! I thought that was a great idea too! The book pillow is something my Mother would have liked. She had a hard time holding up the book while reading in bed. Haralee – I never knew there was such a thing until I started doing research for this post. Isn’t that pillow the best. I’d like to have it! Great ideas. My grandmother loves her digital frame! My mom loved hers too! I was looking for that type of photo frame- a cousin had just told me about it! Awesome! Alana, Isn’t that frame great. It is the most purchased item from that post. My mom had one and loved it. 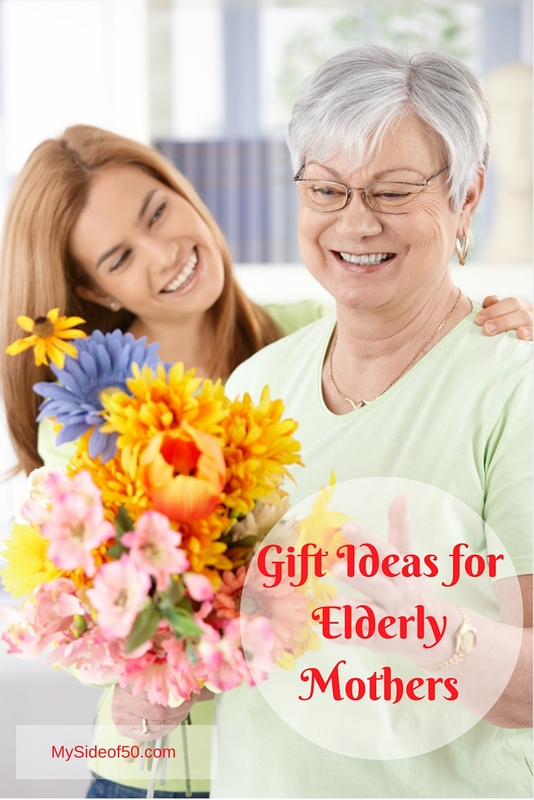 These are such wonderful ideas, I know we used to struggle with gift ideas for my husband’s grandmother before she passed away. I’ll have to remember this for the future! Thanks, Beth. Glad you’ve found it helpful. This is something you don’t think about until you have an elderly person you are buying for. Beth – it is a hard age group to shop for. Glad you found the post helpful! The book rest is perfect!!! Mona – that’s one of the items that I could us for myself. Whoever thought that one up was brilliant! Mona – I love that book rest. The person who thought that up was genius! I love the tote for the walker Cathy and I think it would be a perfect gift for my MIL. I’ve shared over at ST60 & Beyond FB page. I thought that was a nice idea too. Thanks for sharing, Sue! Janice – one of my favorite link parties! That walker pouch is so useful. I can never carry everything I need from room to room. Love all these ideas Cathy! Wish my mom was around to gift….I miss her so much at this stage of life. Lots of great gift ideas! My mother still gets around really well for 86, and she does not like electronics, and does not want to learn to use them, but I think that she would love the digital photo frame. They are all fun things that I would not have thought of. What great ideas Cathy! I love the photo frame and who doesn’t want to lounge is style. I also like the wheelchair bag. thanks for sharing!